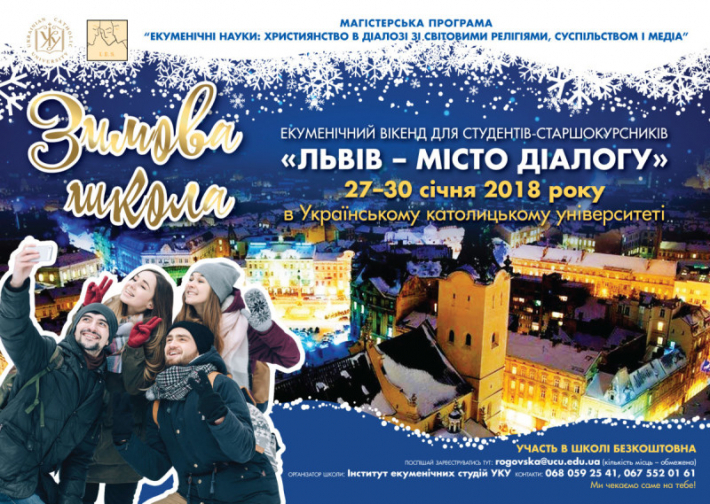 During January 27-30, 2018 Ukrainian Catholic University (UCU) will run a school “Lviv – the city of a dialog”. The school is a part of Master Program “Ecumenical studies: Christianity in dialog with world religions, society and media”. This school is organized by the Institute of Ecumenical Studies of UCU in order to introduce young people to religious situation in Ukraine and Lviv, to provide information on relationship between three branches of Christianity and non-Christian religions, introduce students to established practices of religious matters representation in Ukrainian media and also present social projects of religious organizations of Lviv. Agenda contains lectures, discussions, presentations, sightseeing and visits to religious organizations. Participants of the school will receive board, lodging and transportation. For such weekend are invited senior students and alumni. In order to participate one should fill in application form.